Mark V champion bat - Yasaka table tennis - Champion manufacturer. 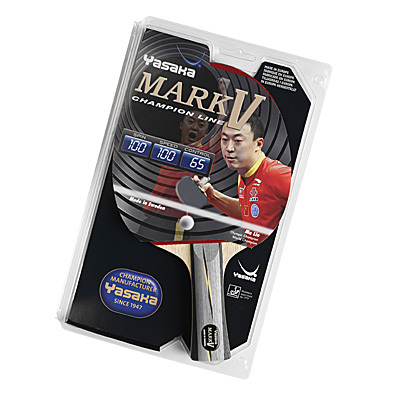 Mark V champion bat - Yasaka table tennis - Champion manufacturer. MARK V is a Yasaka top quality tournament bat. It has the famous MARK V rubbers – probably the most well-known product in table tennis. The rubbers have helped players to win tournaments all over the World. The rubbers together with the competition blade produced in the well-known factory in Sweden are renowned as classics within the world of table tennis. They produce a bat that responds to the very highest demands. The rubber gives top class speed and spin and the blade produces the right feeling for good ball control even in an offensive game. Prefer a faster Mark V bat? Another bat in the Yasaka range – MARK V Carbon has also a layer of carbon inside.